The Adland Bail Out event which saw 70 senior adland figures spend a night behind bars has raised a record-breaking $140,000 for UnLtd’s charity partner Whitelion. 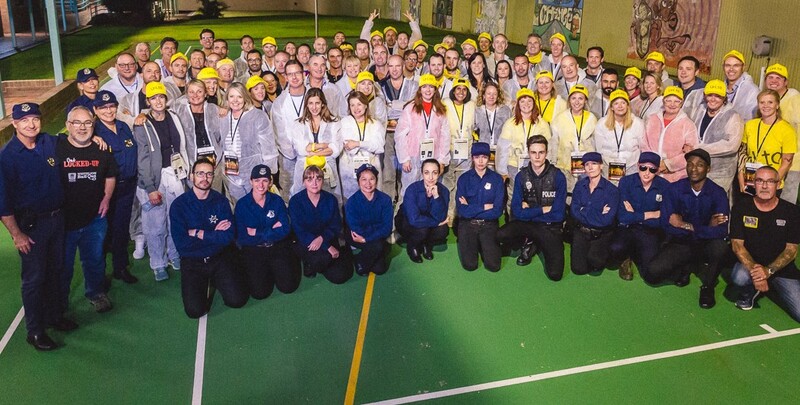 On Friday 4 May, industry leaders from Media Owner, Media Agency, Tech and Creative sides swapped their home comforts to spend a night as ‘’inmates” inside the cells of the chilling Yasmar Facility, a former Juvenile Detention Centre. Instead of the usual champagne reception on arrival, the inmates were lined up, interrogated and finger printed before being locked into their cells. Push-ups and solitary awaited anyone who dared to show up late or misbehave. After a dinner of prison grub the inmates then took part in thought-provoking workshops that highlighted the issues that many young people at risk face. Kurt Burnette, Chief Revenue Officer, Seven commented on the experience: “I gauge experiences in life not just about what it is I actually did but how it made me feel and how it made me think and learn. The experience with Bailout made me feel think and learn about the plight of people who often, through no fault of their own, get dealt the wrong cards. What we got to see in an emotional and confronting evening is how the fantastic work of organisations like Whitelion can do so much good and play such a significant part in changing the lives of people in a positive way. It was inspirational and impactful and so well put together. It is a credit to all involved from Whitelion and UnLtd and to all of those who took part. I was honoured to be an inmate (for a short period of time!)”. In order be released on Saturday morning, each participant was tasked to raise a minimum of $1,000 bail. Thanks to the generosity of our industry and the hard work by the inmates, the event raised an incredible $140,000 for Whitelion making the event the biggest Bail Out event in history. The Media Owner Gang raised the most funds with an impressive total of over $51K raised. The three biggest individual fundraisers – Kurt Burnette, Seven; Lou Barrett, News and Sue Squillace, Spark Foundry - also got the opportunity to swap sides and become guards for part of the night. Bail Out is a national campaign for Whitelion, providing a unique opportunity to step into the shoes of a young person that has been disconnected from our community due to abuse and neglect, drug addiction and poverty. Whitelion is a charity that connects at risk young people with the community to educate them to make positive and often life changing choices through practical and effective support such as mentoring programs, education and employment. Read the great insights about the experience by Arvind Hickman at AdNews or the excellent wrap up with practical ways to help by Denise Shrivell, Mediascope.